The Department of Defense (DOD) Demographics Report (2010) revealed that approximately 1.85 million children have one or both parents serving in the U.S. military. The report further explained that 1.2 million of these children have active-duty parents, and approximately 660,000 children have parents that serve in reserve positions in the military. Out of the 1.85 million military children, 1.2 million of them fall into the K–12 education range of 6–18 years of age (DOD, 2010). The Department of Defense Dependents Education (DODDE, 2012) budget for fiscal year 2013 estimated that 90% of these school-age military children attend public schools that are not sponsored by the DOD. On average, military children move and change schools 6–9 times from the start of kindergarten to high school graduation (Astor, 2011; Berg, 2008; Kitmitto et al., 2011; Sherman & Glenn, 2011). Additionally, these military children move three times more often than their civilian peers, relocating every 1–4 years (Berg, 2008; Bradshaw, Sudhinaraset, Mmari, & Blum, 2010; Hipps, 2011). With military children comprising nearly 4% of the nation’s entire school-age population, public school administrators, teachers and school counselors should expect military students to transition in and out of their school populations (Rossen & Carter, 2011). Public school faculty and staff need to understand the challenges that multiple school transitions impose on military children in order to effectively meet the needs of this student population. In this article, the authors review the literature concerning the obstacles and challenges mobile military children face, and discuss positive interventions that professional school counselors can employ to ease transition. Military families face a unique set of life stressors specific to their culture. Hall (2008) describes the challenges faced by military families by stating that “the defining word for the military family is change; change is what their lives are about” (p. 193). As such, military families experience change and transition so frequently they often do not have time to grieve over the last transition before planning and preparing for the next. Relocation becomes a consistent stressor in the lives of military families, as the average military move occurs every 3 years, and some families, particularly families of high-ranking officers, move more frequently (Hall, 2008). As noted in Weber and Weber (2005), previous studies (Pribesh & Downey, 1999; Simpson & Fowler, 1994; Wood, Halfon, Scarlatta, Newacheck, & Nessim, 1993) found relocation stress to have a detrimental effect on civilian child populations. School-age military children are especially vulnerable to the stress related to frequent transitions, as they must simultaneously cope with normal developmental stressors such as establishing peer relationships (Kelley, Finkel, & Ashby, 2003), conflict in parent/child relationships (Gibbs, Martin, Kupper, & Johnson, 2007; Lowe, Adams, Browne, & Hinkel, 2012), and increased academic demands (Engel, Gallagher, & Lyle, 2010). These additional stressors in conjunction with multiple school transitions could negatively affect the children’s adaption to new school environments. In addition to normative developmental stressors and frequent relocations, military children’s parents are often deployed, which can exacerbate stress in the children and may result in more barriers and maladjustment (Mmari, Bradshaw, Sudhinaraset, & Blum, 2010). Recognizing that these significant stressors for military children may be further complicated by multiple school transitions, the U.S. Army began to explore the lives of these children in order to identify ways to minimize the negative impacts of frequent relocation (Berg, 2008). In conjunction with the Military Child Education Coalition (MCEC), the Secondary Education Transition Study (SETS) was completed, which revealed specific educational challenges associated with multiple transitions (MCEC, 2001). The SETS study exposed several obstacles to transition between schools that impacted military children socially, emotionally and academically. Specific transition challenges identified by SETS for military adolescents include the following: slow transfer of school records and differences in curricula between schools, adapting to new school environments and making friends, limited access to extracurricular activities, a lack of understanding of military culture by public school teachers and staff, and tension at home and parental deployment (MCEC, 2001). The authors reviewed the literature for relevant information on each stressor. Slow transfer of records and differences in curricula between schools. With each move to another state and school, military children encounter the challenges of slow transfer of records and differences in school curricula, which increase frustration with the transition process for parents and students (Sherman & Glenn, 2011). Kitmitto et al. (2011) found that enrollment into a new school could take up to 3 weeks, as the new school awaits the arrival of official records from the previous school. The lack of communication between the previous and receiving schools regarding history of schools attended, curricula, achievements, and stresses and traumas can lead to academic weaknesses (Berg, 2008). As military parents fulfill their duties to serve and protect the United States, the nation’s schools may hinder student progress by requiring them to take classes over again or denying them placement into gifted or special needs education due to slow school record exchange (Astor, 2011). Military children face several academic challenges as a result of frequent school transition. The differences in curricula and school requirements result in educational gaps for military children, which might entail repeating classes and lessons, and missing crucial topics such as multiplication and fractions (Bradshaw et al., 2010). Mmari et al. (2010) noted that parents expressed their concern for their children’s education quality; because of the differences in grade levels between schools, children had to learn the same material or read the same books repeatedly. A recent study by the MCEC reported that the differences in curricula continue to vary from school to school; and parents’ most commonly discussed concerns were the differences in scope and sequence in mathematics, specifically as it leads up to algebra and higher-level coursework (MCEC, 2012). Military parents work hard to fill the gaps in their child’s education due to transition, but many feel that if they do not advocate for their children, they will fall significantly behind their peers academically (Mmari et al., 2010). Adapting to new school environments and making friends. With each move, military children must cope with the stress of making new friends and leaving others behind, adapting to a new school environment at awkward times, and figuring out how to fit in (Kitmitto et al., 2011). In a study conducted by Bradshaw et al. (2010), military students reported that some significant stressors in school transition were adjusting to the physical campus and to the culture of the school, including being aware of the school’s procedures and policies. Military students often transition at random times throughout the school year and experience added stressors such as learning the layout of the school and assimilating into already-established social groups (Bradshaw et al., 2010). Lack of information from the new school, such as not providing a campus map or an explanation of the course schedule, may lead the child to believe that the school is not supportive, which in turn can negatively impact the child’s adjustment to transition to the new school environment (Bradshaw et al., 2010). Military children are frequently forced to end relationships with friends at a previous school and begin new peer relationships at the new school. In a qualitative study of military children, the most commonly mentioned stressor related to school transitions was the challenge of making and maintaining close friendships (Bradshaw et al., 2010). Many students described that the inevitable ending of close relationships led them to avoid making close connections with peers at new schools. With each move, letting go and saying goodbye to friendships becomes harder for the military students; and to avoid the inevitable grief, many students will choose to have superficial relationships instead of close friendships. It is more difficult with such relationships to gain acceptance from established cliques and social networks. This leads to military students often lacking a feeling of connectedness with others in their new schools, which in turn may lead to maladjustment in the transition (Bradshaw et al., 2010). Limited access to extracurricular activities. With each school transition, military students encounter further challenges to retaining or gaining eligibility to participate in athletics and extracurricular activities at their new school (Sherman & Glenn, 2011). Students involved in sports who move late into the school year may miss tryouts for teams. Additionally, transferring to another state may mean that the new school does not offer the same athletic programs (Bradshaw et al., 2010). Even when students are eligible to participate in sports, military students can have difficulty breaking into established athletic programs and teams. Mmari and colleagues (2010) found that military children often experience discrimination when they participate in athletics at the new school. Athletic coaches were reluctant to put military students on teams or in starting positions, as doing so could disrupt the team dynamics. Military students also struggled to bond with their new teammates, especially if a military student’s new position on the team resulted in an established teammate losing a starting position (Mmari et al., 2010). Students taking part in other extracurricular activities, like student government, face similar challenges that limit their involvement. New military students may find that student government elections either happened before they entered the school or rely heavily on established popularity and previous school involvement, which would be difficult or impossible for a new student to demonstrate (Bradshaw et al., 2010). These challenges can negatively affect the military student’s adjustment to a new school, as they may hinder connectedness to the new school environment or create a sense of loss if the student was involved in high-status positions at a former school (Bradshaw et al, 2010). Limited access to these activities can lead to additional mental health concerns for the military student, as a decline in participation in such activities can cause further withdrawal and depressive symptoms (Rossen & Carter, 2011). The transition to a new school includes challenges both in the classroom and beyond. Lack of understanding of military culture by public school teachers and staff. The way in which school teachers and staff interact with military students who transfer to their school can either increase or reduce the students’ stress. Unfortunately, administrators, educators and counselors in public schools tend to be unfamiliar with the specific issues and stressors that mobile military students encounter (Harrison & Vannest, 2008). Horton (2005) noted that because of their limited experience with the military, civilian school staff have a knowledge gap that affects their competence and effectiveness in working with military students and families. The school staff’s lack of understanding about the military students’ culture results in varying degrees of interactions ranging from overly sensitive to completely insensitive to their needs. Bradshaw et al. (2010) found that teachers’ expectations differ because they struggle with the right thing to do. Some teachers have high expectations for new military students and expect them to assimilate rather than acknowledging their unique issues. Other teachers recognize some of the issues military students face because of deployment, but choose to avoid the topic of war in the classroom or discourage the students from talking about their experiences as to not upset the students (Bradshaw et al., 2010). In addition to the issue of sensitivity, teachers who are not familiar with military culture may maintain negative stereotypes or political ideologies that influence the way they interact with military students (Fenell, 2008). Horton (2005) explained that it is also possible for public school staff members to harbor strong negative feelings about the military, which may impact their treatment of the military students. Fear of discrimination may also be a factor that impedes school staff from identifying military students in their schools, as parents and students may not reveal their military connection (Bradshaw et al. 2010; Mmari et al., 2010). Additionally, Mmari and colleagues (2010) found that many teachers and counselors had not received information that would help them identify students connected to the military. While part of the school staff felt that properly identifying military students could aid in assisting and connecting with these students, others felt that labeling this population could result in prejudice toward the students by anti-military staff. A majority of the parents in the study reported that school staff did not know how to deal with and support military children and issues such as deployment, and that more training is needed (Mmari et al., 2010). Tension at home and parental deployment. Relocation increases stress for all military family members. In preparing to move, parents are swamped with concerns and to-do lists, and may not have the patience or time to consider a child who is resistant to the transition (Hall, 2008). The numerous moves can leave parents feeling physically and emotionally exhausted, and less emotionally able to help their children cope with stress related to relocation (Bradshaw et al., 2010). Several studies reported that parental stress directly impacts the child’s ability to cope during stressful situations (Hall, 2008; Mmari et al., 2010; Waliski, Bokony, Edlund, & Kirchner, 2012). Further, parental stress increases the likelihood of conflicts between the parent and child and could lead to child maltreatment (Rentz et al., 2007; Waliski et al., 2012). Parents’ stress can exacerbate the emotional stress and frustration already felt by the military child due to transition. In a qualitative research study by Bradshaw et al. (2010), the majority of military students reported that moving increased tension in the home. Some students reported feeling anger and resentment toward their parents and the military because of the constant uprooting and disruption due to change of duty stations. Many students reported telling parents that they refused to move or would run away to avoid moving again (Bradshaw et al., 2010). This negative and resistant behavior from a child can be an additional source of stress for the family. Parents may in turn view the behavior as a problem and punish or avoid the child instead of acknowledging the emotional strain the student is facing with transition (Harrison & Vannest, 2008). The emotional stress of relocation can be further complicated if the military parent is deployed or at risk of being deployed. The constant fear for a parent’s safety can negatively affect a child academically, emotionally and behaviorally (Chawla & Solinas-Saunders, 2011; Harrison & Vannest, 2008; Mmari et al., 2010). Having a parent deployed in conjunction with a transition can lead to increased feelings of depression and anxiety. In a qualitative study of military students, many participants reported increased fear and anxiety for deployed parent’s safety. These military students also reported difficulty coping with the absence of the deployed parent at special occasions such as birthdays, school programs and sporting events (Mmari et al., 2010). Absence of the deployed parent from these significant life events can cause stress, depression, feelings of loss, and anxiety for the military child. These feelings are often externalized in the form of declining grades and behavior problems at home and school (Harrison & Vannest, 2008). Adolescents also may experience increased stress with role ambiguity during a parent’s deployment—as the family instantly becomes a single-parent home, the adolescent may take on additional responsibilities to support the remaining parent (Chawla & Solinas-Saunders, 2011; Harrison & Vannest, 2008). Research following Operations Desert Shield and Desert Storm during the Gulf War in 1991 confirmed that stresses do occur within families during and after deployment (Jensen & Shaw, 1996; Kelley, 1994; Norwood, Fullerton, & Hagen, 1996; Pierce, Vinokur, & Buck, 1998; Rosen, Teitelbaum, & Westhuis, 1993). In their study of absent Navy mothers due to deployment during the Gulf War, Kelley, Herzog-Simmer, and Harris (1994) found that maternal depression, decreased self-esteem, and dysphoria were significantly correlated with children’s internalizing behavior (e.g., anxiety, depression). Likewise, nondeployed parents also experience stress during times of deployment (Mmari et al., 2010), which in turn may be felt by children in the home (Chawla & Solinas-Saunders, 2011). Harrison and Vannest (2008) report that in addition to feelings of worry and fear for their spouse’s safety, the remaining parent also grapples with the stress of increased role expectation and responsibilities as a single parent. Without support, the remaining parent may cope with role strain and anxiety by withdrawing emotionally from their children or responding with severe punishment to misbehavior (Harrison & Vannest, 2008). These children may face an increased risk of maltreatment or neglect as the remaining parent may become abusive to the children when a spouse is deployed (Chawla & Solinas-Saunders, 2011; Gibbs et al., 2007; Rentz et al., 2007). Deployment can have significant detrimental effects on an entire military family’s well-being and coping skills. While researchers have found many negative outcomes associated with school transitions for military children, supportive relationships appear to have a positive influence on outcomes for this group. Although the majority of the literature discusses the damaging consequences that multiple school transitions have on children from military families, some studies found that multiple school transitions fostered strength and resiliency. Lyle (2006) reported that there are mixed results in the literature regarding the effects of multiple school transitions. Multiple transitions have been shown to equip military children with more adaptability, accelerated maturity, deeper appreciation for cultural differences, and strong social skills in comparison to their civilian peers (Bradshaw et al., 2010; Mmari et al., 2010; Sherman & Glenn, 2011; Strobino & Salvaterra, 2000). Weber and Weber (2005) actually reported a lower rate of problems experienced by military adolescents exposed to increased frequency and number of relocations. Strobino and Salvaterra (2000) stated that whether transition affects military children positively or negatively depends largely upon their support systems. Students’ preoccupation with feelings of isolation and loneliness during school transition could result in poor grades and a decline in academic achievement. In contrast, military students who welcome change and find a new sense of responsibility during school transition may experience improved academic performance and achievement. It also was found that despite five or more school transitions, military children reported average to above-average grades, active involvement in extracurricular activities, and support of teachers and parents. This study attributed the positive adjustment of military students during multiple school transitions to supportive school cultures and strong parental involvement. The positive and negative results reveal that the level of school and parent support may be indicators of how well military students adjust during multiple school transitions (Strobino & Salvaterra, 2000). Given the extensive influence that the school environment has on military students’ adjustment during school transitions, the importance of developing a supportive and understanding relationship with this student population is paramount. Rush and Akos (2007) note that school counselors are uniquely qualified to assist students with social, emotional and academic concerns. School counselors are specifically trained in child development, and they work closely with numerous sources of student support including parents, teachers and peers. Waliski et al. (2012) confirm that counselors possess the education and skills needed to help military students and are readily accessible within their community. Professional school counselors also have access to academic data that can be used to identify the specific needs of an enrolling military student, such as standardized test scores, attendance records, discipline referrals and report cards. Moreover, school counselors serve students directly by developing and implementing preventive programs and interventions that facilitate support and social belonging such as classroom guidance, intentional guidance groups and peer mentoring (Rush & Akos, 2007). The role of school counselors within the school environment places them in a unique position to serve and advocate for enrolling military students and consequently transform school transition into a positive experience. The following sections will provide an overview of ways that school counselors can support military students in their own schools. To initiate change, school counselors must first be informed about military life and become knowledgeable about resources and culturally sensitive interventions suited for military students (Waliski et al., 2012). Understanding the challenges and the unique needs of military students will help school counselors support military students and families during times of crisis (Harrison & Vannest, 2008). Several resources are available to assist school counselors in becoming advocates for and providing resources and interventions to military students. 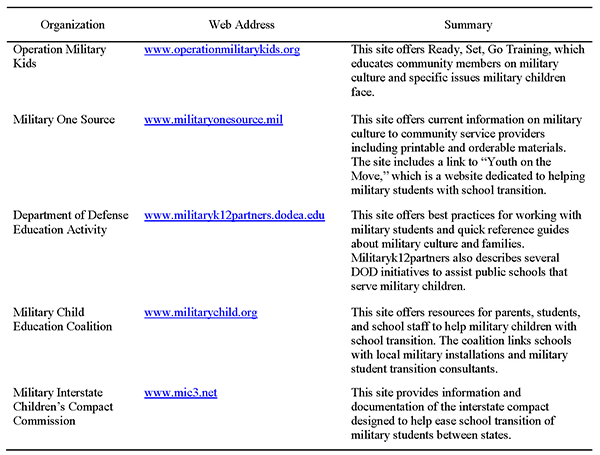 Organizations such as Operation Military Kids (OMK) and Military One Source provide specific tools and trainings on assisting military children and parents for school staff and community stakeholders (Eason, 2012). These resources could be used in staff development, classroom guidance, parent/teacher conferences, and small group and individual counseling (see Table 1). With regard to strategies and programs that acclimatize new students to schools and ease the transition process, student-to-student programs were noted repeatedly in the literature (Berg, 2008; Bradshaw et al., 2010; Harrison & Vannest, 2008; Mmari et al., 2010; Strobino & Salvaterra, 2000). These programs connect new students with current students, who act as guides to the school grounds and reduce anxiety by initiating the friend-making process. One such program is noted by Rush and Akos (2007) in working with middle school students. The authors developed a 10-session, combination psychoeducational-counseling group created by school counselors to increase student knowledge concerning the deployment process. In addition to information sharing by the group leaders and group members early in the process and at the beginning of each session, the “later sessions, and the latter part of each session, are purposefully structured to be less directive and more process oriented to allow group members to pursue individual goals and provide more intrapersonal focus to help with particular issues that emerge” (Rush & Akos, p. 116). Students are further supported through the development of coping skills in a safe, encouraging environment. Another avenue to help students adjust and adapt is connecting parents and caregivers to community resources. Mmari et al. (2010) found that some military parents did not utilize resources simply because they did not know they were available. Waliski et al. (2012) explained that counselors can serve as gatekeepers through whom military families can gain access to appropriate programs and services. Additionally, school counselors are in an advantageous position to develop partnerships between families and communities, to identify challenges such as transitions, to address these issues, and to advance student progress (Epstein & Van Voorhis, 2010). As military families transition, they may be unfamiliar with their new community and struggle to locate health care providers, childcare, tutoring, and mental health and counseling resources. School counselors are often equipped with lists for local providers and resources that could ease the transition for mobile military families. In addition to local resources, school counselors can proactively assist military children and their families by maintaining a record of resources specific to military families. For example, Tutor.com provides free tutoring and resources for military students (“Tutor.com for U.S. military families,” 2014). Also, a new Web site sponsored by the Department of Veterans Affairs, “Parenting for Service Members and Veterans,” has been launched just for military families (Department of Veterans Affairs, 2013). This resource addresses the unique challenges of parenting in military families through an online anonymous parenting course, interactive activities, and stories of real military and veteran families that provide valuable skills for the everyday challenges of raising military children. The course and content were developed by experts from the DOD. By connecting parents to resources, the school counselor can assist in reducing tension at home and increasing parental support and school involvement. An important strategy for school counselors to implement in their schools is facilitating school staff trainings specific to military culture and needs of military students. Harrison and Vannest (2008) suggest that teachers receive professional development focused on military culture and the skills necessary to assist their military students. Strobino and Salvaterra (2000) explain that it is important for all stakeholders to be aware of the relationship between the student’s experiences and school success. School counselors and other school professionals are encouraged to focus on identifying the strengths of military students. Staff training can facilitate cultural sensitivity and supportive student/teacher relationships that contribute to positive school experiences. A number of organizations—from the community to the national level—can provide training to assist educational professionals in working with the military community. Veterans’ organizations, such as Veterans of Foreign Wars (VFW) or the American Legion, have posts in local communities with representatives appointed to serve schools and other civic institutions. National Guard or reserve posts and active-duty military installations have a public affairs officer (PAO) who is available to discuss military-related issues such as deployment with the educational community as well. Additionally, the MCEC (2012), a federally recognized nonprofit organization, is specifically “focused on ensuring quality educational opportunities for all military children affected by mobility, family separation, and transition.” They provide ongoing training for school counselors and other education professionals both online and in face-to-face settings. Two MCEC programs in particular relate directly to school transitions. The Supporting Military Children through School Transitions: Foundations focuses on the military-connected child’s experience with transitions by addressing “military lifestyle and culture, school transition perspectives, and identifying local transition challenges.” The second program—Supporting Military Children through School Transitions: Social/Emotional Institute—focuses on the social and emotional effects of student transitions, including “deployment and separation, building confidence and resiliency, and supporting children through trauma and loss” (MCEC, 2012). In addition to interventions used at the individual school level, school counselors can advocate for military students at the local, district and state levels. A valuable resource for school counselors is the Military Children Interstate Compact Commission. The Council of State Governments and the DOD worked collaboratively to develop an Interstate Compact that would address the challenges military families face with each school transition (Kitmitto et al., 2011). The Compact addresses transition issues such as slow transfer of records, course and curriculum differences and equivalents, attendance, accessibility to extracurricular activities, and graduation requirements. Through the guidelines and detailed governance structure, the Compact allows for the uniform treatment of these challenges at the state and local district level. Currently, 43 states have signed the Interstate Compact (Matthews, 2012). It is important for school counselors to be aware of their state’s standing on the Compact. School counselors can advocate for compliance with the guidelines set by their adoption and for implementation of the guidelines if their state has not become a signatory. Military families experience unique stressors related to the military culture, such as parental deployment and multiple relocations. The literature attributes the negative effects of multiple school transitions to factors such as tension at home and parental absence, slow transfer of school records and differences in curricula between schools, adapting to new school environments and making friends, limited access to extracurricular activities, and a lack of understanding by school teachers and staff of military culture. The majority of the reviewed literature found that the challenges of mobile military students can lead to a decline in academic achievement and social/emotional problems. Research seems to suggest that supportive relationships and an encouraging school environment can help military students adjust to the struggles that they are likely to face. The literature points to the professional school counselor as being the most appropriate staff member to foster these positive experiences and advocate for new enrolling military students. School counselors can create a positive experience for new enrolling military students by connecting parents and caregivers to community resources, advocating for quick transfer of school records, creating programs that acclimate new students to school grounds and culture, encouraging accessibility to extracurricular activities, and facilitating school staff trainings specific to military culture and the particular needs of military students. Berg, K. F. (2008). Easing transitions of military dependents into Hawaii public schools: An invitational educational link. Journal of Invitational Theory and Practice, 14, 41–55. Bradshaw, C. P., Sudhinaraset, M., Mmari, K., & Blum, R. W. (2010). School transitions among military adolescents: A qualitative study of stress and coping. School Psychology Review, 39, 84–105. Eason, M. (2012, November). Operation military kids. Program session presented at the annual conference of the Georgia School Counselors Association, Athens, GA.
Epstein, J. L., & Van Voorhis, F. L. (2010). School counselors’ roles in developing partnerships with families and communities for student success. Professional School Counseling, 14, 1–14. Hall, L. K. (2008). Counseling military families: What mental health professionals need to know. New York, NY: Routledge. Hipps, T. (2011, June). Removing educational obstacles for military kids. Soldiers, 66(6), 16–19. Jensen, P. S., & Shaw, J. A. (1996). The effects of war and parental deployment upon children and adolescents. In R. J. Ursano & A. E. Norwood (Eds. ), Emotional aftermath of the Persian Gulf War: Veterans, families, communities, and nations (pp. 83–109). Washington, DC: American Psychiatric. Kelley, M. L., Finkel, L. B., & Ashby, J. (2003). Geographic mobility, family, and maternal variables as related to the psychosocial adjustment of military children. Military Medicine, 168, 1019–1024. Kelley, M. L., Herzog-Simmer, P. A., & Harris, M. A. (1994). Effects of military-induced separation on the parenting stress and family functioning of deploying mothers. Military Psychology, 6, 125–138. Lowe, K. N., Adams, K. S., Browne, B. L., & Hinkle, K. T. (2012). Impact of military deployment on family relationships. Journal of Family Studies, 18, 17–27. Military Child Education Coalition. (2001). U.S. Army secondary education transition study: Executive summary. Arlington, VA: Military Resource Center. Norwood, A. E., Fullerton, C. S., & Hagen, K. P. (1996). Those left behind: Military families. In R. J. Ursano & A. E. Norwood (Eds. ), Emotional aftermath of the Persian Gulf War: Veterans, families, communities, and nations (pp. 163–196). Washington, DC: American Psychiatric. Pribesh, S., & Downey, D. B. (1999). Why are residential and school moves associated with poor school performance? Demography, 36, 521–534. Rosen, L. N., Teitelbaum, J. M., & Westhuis, D. J. (1993). Children’s reactions to the Desert Storm deployment: Initial findings from a survey of Army families. Military Medicine, 158, 465–469. Rossen, E., & Carter, C. D. (2011, February). Supporting students from military families. Principal Leadership, 11(6), 14–18. Sherman, M. D., & Glenn, M. A. (2011, January/February). Opportunities for school psychologists working with children of military families. Communiqué: The Newspaper of the National Association of School Psychologists, 39(5), 17–19. Simpson, G. A., & Fowler, M. G. (1994). Geographic mobility and children’s emotional/behavioral adjustment and school functioning. Pediatrics, 93, 303–309. Strobino, J., & Salvaterra, M. (2000). School transitions among adolescent children of military personnel: A strengths perspective. Social Work in Education, 22, 95–107. Weber, E. G., & Weber, D. K. (2005). Geographic relocation frequency, resilience, and military adolescent behavior. Military Medicine, 170, 638–642. S. Beth Ruff is a school counselor at Bright Star Elementary School in Douglasville, GA, and a doctoral student at the University of West Georgia. Michael A. Keim, NCC, is an Assistant Professor of Professional Counseling at the University of West Georgia. Correspondence can be addressed to S. Beth Ruff, Bright Star Elementary School, 6300 John West Road, Douglasville, GA 30134, Beth.ruff@douglas.k12.ga.us.